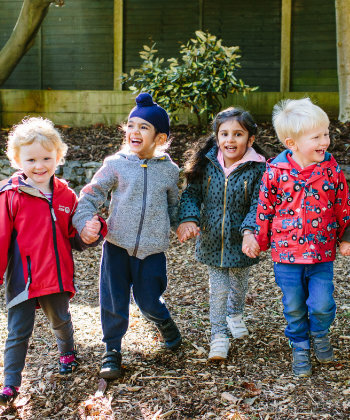 The Forest Schools initiative has gained nationwide recognition as a highly effective way of introducing children to the great outdoors, while at the same time enabling them to develop a wide range of transferable skills. Whatever the weather, our children will be found making dens and shelters, lighting campfires, learning about the natural environment and how to cherish it, practising basic survival skills and bushcraft and benefiting from lots of fresh air. We believe that the Forest Schools programme provides an excellent vehicle for learning and development. Children have a great affinity with the natural world. It arouses their curiosity and inspires wonder. It is a superb environment in which to assimilate knowledge and develop all manner of skills such as teamwork, good communication, problem solving, self-confidence, risk awareness and a positive mental attitude. Rosie Phipps, the Nursery Manager of the Norfolk Road setting, has gained a Level 3 Certificate in Forest Schools Programme Leadership. She leads the programme at both settings utilising a variety of specialist equipment including fire pits, den making materials, tools and cooking utensils. Should you wish to learn more about the Forest Schools Programme at Norfolk House Nursery, Rosie would be only too pleased to discuss it with you. I would like thank you on behalf of myself and most importantly my daughter for all the care and fun you have provided her over the past three years. Thank you very much or the wonderful service you have provided.